Japan does the New Year differently. There aren’t any major fireworks displays, instead countdowns are done at shrines and temples and people eat soba noodles. But because it’s one of the few days during the year where people have some time off work, it also means a lot of car enthusiasts come out to play. To make up for the lack of fireworks, the cars come out to kick off the first couple of days of the new year with noise. Lots of it. Kicking off every year are two of the biggest meets; the Daikoku Parking Area New Year’s Meet, and the Hanyu Parking Area New Year’s Meet. The first one was the meet at Hanyu PA in Saitama Prefecture, around an hour north of Tokyo. It’s the same location as the last big meet of 2017 so quite a few of the cars from that event were also present. We got there at around 9 a.m. and immediately there were already a few cars there; the white Ferrari F50 from the Anija crew caught my eye. The owner of this particular car takes it out quite often to meets so it’s always nice to see this out. Of course, this being Japan, it’s not without some modifications. Keen-eyed readers will know the F50 was never originally offered in white, this was repainted white by Ferrari later on in its life. As you may have noticed, Japan loves white supercars. The wheels were also specially made for the car, as were the custom exhausts. An exotic rear-engined European two-door coupe. Unlike the meet last month, there was no other stop after this, so cars would show up and then go back home. A quick walk around the parking area it was clear supercars were the norm, with more everyday cars being kind of the exception. Seeing cars like the white Brabus Smart and Japanese sports cars among the European exotics gave some much needed balance to the meet. Amazingly there were no police this year. Last year they had come to kick people out for parking at the spaces reserved for buses and trucks. Instead, there were attendants directing the regular cars to the the normal spaces while letting supercars park at the special spots for larger vehicles. I’ve never seen anything like it before: parking wardens who were actually nice. By around 10 a.m. the majority of the cars had arrived and filled up the parking area, yet again. The Anija crew made their entrance known by rolling up in their Lamborghinis, doors up and engines revving. As supercar owner groups go, these guys are some of the most entertaining. There’s never a dull moment with them around. After all, how many people out there would put gold chrome wheels on a Ferrari F40? This was my second time at this meet and there’s always one big surprise. The unexpected one this year was the Vector W8, with chrome wheels of course. It was my first time seeing one of the just 19 W8s made. Oddly enough, perhaps due to its peculiarity, not many people seemed particularly interested in it. The owner even parked it out in the back away from the main crowd. There aren’t many times a Vector can go under the radar. Other surprising highlights included a Lamborghini Miura and Lancia Stratos. 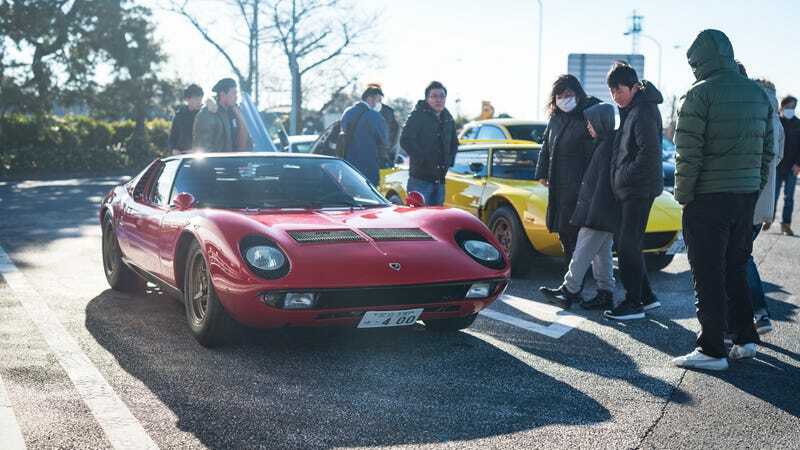 Unsurprisingly, the Miura was immediately bombarded by a crowd of camera-ready admirers, making the Stratos fade away in the background. Another duo that showed up not long after was the Porsche Carrera GT and 918 Spyder. Unfortunately they didn’t stay long as there was literally nowhere for them to park. There’s no actual organization of the meet, but people have just been coming here after New Year for years and word has spread around. I spoke with Shouta, the owner of the satin silver Ferrari 458 Speciale who came here with his father in the green RUF RT-35, and he said it was a great place to meet with friends and speak to new people who are also interested in cars. Shouta recently swapped a Mclaren 650S Spider for the Ferrari which has been lowered, had the roof wrapped black, and given a Novitec exhaust. As nice as it was to drool over these supercars some of the quirkier Japanese cars were just as nice to see. One of the highlights for me was seeing the ‘ABC’ trinity of 90s kei-sports cars; the Mazda AZ-1, Honda Beat, and Suzuki Cappucino. Except the AZ-1 wasn’t actually an AZ-1 but the Cara, Suzuki’s version of the AZ-1. Speaking of quirky Japanese cars from Suzuki, there was also a Suzuki Twin made to resemble a Porsche. It even had a ‘GT2WIN’ decal on the side. There was a healthy amount of ‘90s domestic sports cars too. From modified examples to factory original condition cars, there it was nice to see the appreciation of these cars among the foreign supercars. Interestingly, there weren’t any modern Japanese sports cars such as R35 GT-R or new NSX at the meet. Instead we had NA1s, R34s, and FDs. As it neared noon and when we thought the meet was coming to an end, a lone Ferrari F50 showed up. The owner hadn’t even got out of the car and it was already swarmed. Like everyone else, the F50 left in a rather animated manner. Most people definitely come to this meet to get videos of the cars leaving than photos of them parked up. Last year there was an incident of a Ferrari 360 driver leaving too exuberantly and crashed, so this year the drivers took a little bit easier than before. This was easily one of the best and biggest meets I’ve been to in Japan. If it all goes well it should be held again next year, if you’re keen to see a bunch of supercars gathered up at a motorway parking area during your New Year’s holiday. While this was a great way to kick off 2018, the Daikoku New Year’s Meet was a lot bigger, and a lot better in terms of car diversity. Stay tuned for that.